If you know me, you know it’s no secret that I love fashion. I do not, however, enjoy the actual act of shopping itself all of the time. When shopping amongst a group of women, it can get ugly. During a Macy’s One Day Sale on Black Friday, it is like a pack of wolves searching for one lost lonely rabbit in the forest. The last wolf in chic clothing who is standing wins the coveted, single cashmere sweater that is dressed on the mannequin. That is exactly why I never go shopping on Black Friday. The sales are just not worth the aggravation. If you are a smart shopper, you can get great deals any day of the week. Since I am not always up for a shopping trip, I have to get inspiration from all different mediums. The new highly addictive source is Pinterest. Just look under products and you can find hoards of new treasures that spark your interest. Also, I always consult People Style Watch every month for new trends and fashion forward tips. But, surprisingly enough, I never realized how much TV shows influence my sense of style until this week. 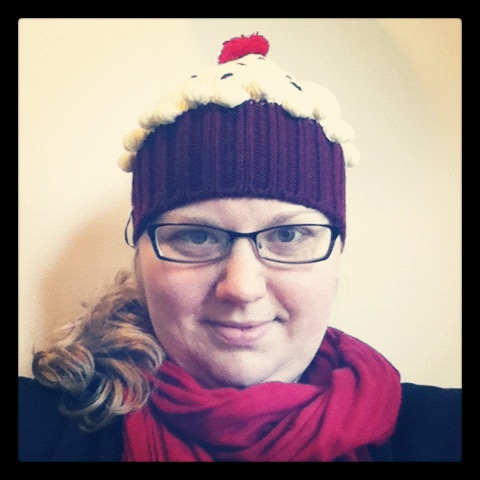 During my weekly viewing of Last Man Standing (if you have not caught an episode you should), Mandy (a zany teenager) was wearing a cupcake knit hat that I took a liking to. I thought this was such a cute piece to have this winter. It’s perfect for me because I own a bakery and because it presents so much personality in such a simple piece. I decided to track this hat down on the internet. My go-to site for finding random items without knowing the brand-name is Amazon. All I did was type in cupcake hat and there it was listed in a variety of flavors to choose from. I went with what Mandy was wearing on the show Red Velvet but there was also Strawberry, Vanilla, and Chocolate to choose from as well. Here’s a picture of me with my latest find to give you some encouragement. To all you fashionistas out there, I hope you find your inspiration this week.